The drawing is on blue colored paper that the artist made himself. "Praying Hands" is part of a series of sketches that Dürer drew for an altarpiece in 1508. The drawing shows the hands of a man praying with his body out of view on the right. The sleeves of the man are folded and noticeable in the painting. The work was originally requested by Jakob Heller and is named after him. It is posited that that sketch is actually modeled after the artist's own hands. Similar hands are featured in other of Durer's artworks. It is also theorized that there is a deeper story connected to "Praying Hands." A heartwarming story of familial love, sacrifice, and homage. The following account is not attributed to an author. However, there is a copyright filed in 1933 by J. Greenwald called "The Legend of the Praying Hands by Albrecht Durer." Despite the family strain, two of Durer's male children, Albrecht the Younger and Albert, had a dream. They both wanted to pursue their talent for art, but they knew that their father would never be financially able to send either of them to Nuremberg to study at the academy there. After many long discussions at night in their crowded bed, the two boys finally worked out a pact. They would toss a coin. The loser would go to work in the nearby mines and, with his earnings, support his brother while he attended the academy. Then, in four years, when that brother who won the toss completed his studies, he would support the other brother at the academy, either with sales of his artwork or, if necessary, also by laboring in the mines. They tossed a coin on a Sunday morning after church. Albrecht the Younger won the toss and went off to Nuremberg. Albert went down into the dangerous mines and, for the next four years, financed his brother, whose work at the academy was almost an immediate sensation. Albrecht's etchings, his woodcuts and his oils were far better than those of most of his professors, and by the time he graduated, he was beginning to earn considerable fees for his commissioned works. All heads turned in eager expectation to the far end of the table where Albert sat, tears streaming down his pale face, shaking his lowered head from side to side while he sobbed and repeated, over and over, "No." Finally, Albert rose and wiped the tears from his cheeks. He glanced down the long table at the faces he loved, and then, holding his hands close to his right cheek, he said softly, "No, brother. I cannot go to Nuremberg. It is too late for me. Look what four years in the mines have done to my hands! The bones in every finger have been smashed at least once, and lately I have been suffering from arthritis so badly in my right hand that I cannot even hold a glass to return your toast, much less make delicate lines on parchment or canvas with a pen or a brush. No, brother, for me it is too late." More than 450 years have passed. 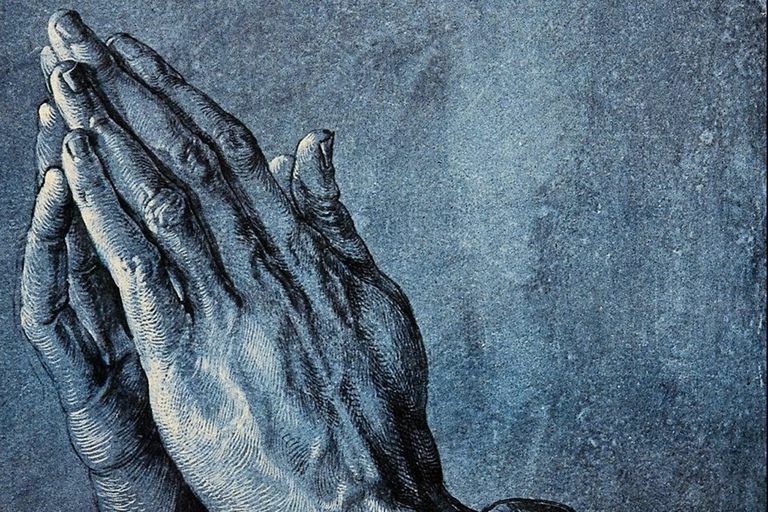 By now, Albrecht Durer's hundreds of masterful portraits, pen and silver-point sketches, watercolors, charcoals, woodcuts, and copper engravings hang in every great museum in the world, but the odds are great that you, like most people, are familiar with Albrecht Durer's most famous work, "Praying Hands." Some believe that Albrecht Durer painstakingly drew his brother's abused hands with palms together and thin fingers stretched skyward in honor of his brother Albert. He called his powerful drawing simply "Hands," but the entire world almost immediately opened their hearts to his great masterpiece and renamed his tribute of love, "Praying Hands." Let this work be your reminder, that no one ever makes it alone!